It’s been fun sparring all winter with my buddy, Paul Reddam, not on the merits and talents of Nyquist, but his schedule leading up to the Derby. I still question it to a degree, but, despite his pleas not to do it, I have no choice but to put him No. 1. Sorry, Paul, your horse is just too darn talented, and there is no one else who deserves to be up there. As for the Florida Derby, Nyquist again demonstrated how difficult, or to this point, impossible, it is to pass him. He is like the Predator from the movie of the same name. Once he zeroes in on you and gets you in his sights, your fate is sealed. Because of the buildup of the race, Nyquist received the highest superlatives for his performance. The more cynical types, however, will point to the fact that once Mohaymen folded early, there was nothing much to beat, and the runner-up was coming off a so-so maiden victory in his fifth career start. They will also point to Nyquist’s very ordinary 94 Beyer figure. They can also point to his drifting out noticeably in the stretch and switching over to his left lead. That can be attributed to his simply losing focus by gawking at the big crowd on the apron and Guiterrez looking back over his right shoulder. Despite the drifting, he still came home his final eighth in a respectable :12 3/5. From a visual standpoint, I thought he had great extension to his stride nearing the finish, and as the expression goes, he ran through the wire, even on his wrong lead. I also feel the Beyer figure is questionable at best, as the track was drying out for the second time, and with three grass races leading up to the Florida Derby and a 2 1/2-hour gap between dirt races, it would seem difficult to get a true read on this track, and the 1:49 flat was solid. The bottom line is that Nyquist is your quintessential warrior who simply was sharper than Mohaymen, coming off the rapidly run San Vicente, and by running his opening half and three-quarters 13 to 15 lengths slower than he did in the San Vicente, no one was going to catch him. Now, whether he can win the Kentucky Derby off only this one two-turn race only time will tell. This is when Baffert really starts tightening the screws, so it was no surprise to see him work 5 furlongs for the Santa Anita Derby in a bullet :59, fastest of 19 works at the distance and then follow it up with a sharp :47 flat breeze. With the way he worked and how he closed the final sixteenth in the San Felipe, he may very well be favored over Danzing Candy, especially having the magical name of Baffert attached to him. With I Will Score working 5 furlongs over the weekend in :58 flat, it could mean that Danzing Candy will not have an uncontested lead this time. What he has going for him on his Thoro-Graph figures is having run a super fast race in his second career start last year. Although he ran one of the fastest figures of any 3-year-old this year in the San Felipe, it wasn’t as fast as his race early in his 2-year-old campaign, so there really is no worry about him bouncing off that, with such a fast number at 2 to fall back on. He is not your typical Gary Stevens-type horse, so expect Stevens to try to get him in gear a little earlier. As mentioned, he doesn’t have a monster kick, but he can wear you down with that long stride and relentless steady run. He just needs to put himself in striking position by the eighth pole to avoid a repeat of the San Felipe. Either that or hope Danzing Candy comes back to him a little earlier. He has demonstrated his ability to stalk the pace, but that was last year. Now, against faster horses, he has to show he can cut into a :46 and 1:11 pace, rather than the slower fractions he’s been used to. This week’s work will help him hone his speed. The more I look at his last two races the more I like him. Although his pedigree is only fair when it comes to 1 1/4 miles, his Brisnet figures confirm the versatility and improvement he’s shown. He ran a very strong 111 late pace figure two races back, and then ran triple-digit early and middle figures in the Rebel. His final speed figures of 83, 84, 97, and 99 show a nice steady improvement, suggesting he’s just now about to reach his peak. And that 99 already is only a few points behind the top figures this year. But it must be noted, his Thoro-Graph figures have not been very fast, even in the Rebel. Still, for a horse to come from off the pace with a big sweeping outside move and close as fast as he did and then make his stakes debut across the country and set a demanding :22 4/5 opening quarter and solid half in :46 4/5 and still come home his final sixteenth in just under :06 1/5 is the sign of a very talented horse. Baffert obviously wasn’t looking for any speed in his :50 half-mile breeze, as Martin Garcia took him about 8 to 9-wide at the head of the stretch, but he had great extension through the stretch. We have no idea how good this colt really is, but he could be special and he’s getting good at just the right time. Had his first work at Churchill Downs, breezing a half in :50 3/5. Now it’s just a matter of waiting the six weeks from the Louisiana Derby. With boxes checked in both the plus and minus columns, it’s up to each person to decide which ones override the others. The feeling here is that the positives slightly outweigh the negatives, but does that mean he’s ready to win the Kentucky Derby? On the plus side, he has the pedigree, he is improving with each start, he has good tactical speed, he can put himself in excellent position, and he has the turn of foot to move whenever the rider wants. And he has a trainer who is on the ballot for the Hall of Fame this year. On the negative side, he still races greenly, whether it’s drifting out or drifting in or switching back to his left lead in the stretch, his speed figures have been on the slow side and haven’t improved much on Thoro-Graph, and he has had perfect trips in his two starts this year, which may have contributed to his so-so Thoro-Graph figures. And finally, there is the six weeks and the fact that no Louisiana Derby winner has ever gone straight into the Kentucky Derby and won. The only two horses who have won both races – Grindstone and Black Gold -- had a race in between. I confess I have no idea where to rank him after that performance. Yes, he took the worst of it by racing wide every step of the way, and you can’t concede that much ground loss to a horse like Nyquist, but he still should have hung in there longer and beaten the rest of these horses. He seemed to move smoothly into a threatening position passing the three-eighths pole, but it became obvious right away he was a beaten horse when Alvarado began pushing hard before going to an early right-handed whip, while Guiterrez was still just sitting chilly on Nyquist. Did Mohaymen simply have it too easy all winter defeating small and questionable fields in his two starts? Perhaps he didn’t handle the twice-drying out track. When a horse goes undefeated without really being tested, as Mohaymen has, you never know how a defeat such as this will affect him. But remember, he did run 54 feet farther than Nyquist, and after the first rain, the track was favoring the inside. Who knows how it was after the aforementioned 2 1/2-hour gap between dirt races and a second rain? It sure looked like it was favoring the inside the way maiden winner Majesto came charging though along the rail. Mohaymen has too much class and talent not to deserve every chance to bounce back. It is important to remember that his Thoro-Graph figures were faster than Nyquist’s going into the race. Whatever the reason for such a sound defeat this was a major disappointment and setback, and now the question is, can he recover in five weeks or was he and the Florida-based 3-year-olds exposed? We’ll see how Flexibility runs in the Wood Memorial to get an idea just what he was beating last year. History shows that horses do not rebound off this kind of an effort and win the Kentucky Derby. Thunder Gulch and Mine That Bird were able to recover from their previous subpar races, but neither was beaten 8 1/4 lengths. Still, you can’t lose faith in him off one race, because you don’t know how a horse is feeling on a particular day and there was no way to predict this. You can bring him into the Kentucky Derby with hope he can rebound, but certainly not with a lot of confidence. It took him nearly three weeks, but he finally made it back to the work tab, breezing a half in :48 4/5. He could climb back up if he has some eye-popping works with strong gallop-outs. It was announced he will train up to the Kentucky Derby; yet another unorthodox move that goes against tradition. But looking at his Thoro-Graph figure in the Tampa Bay Derby and the huge jump from the Sam Davis I can at least understand the reasoning behind it. His negative Tampa Bay Derby fig was by far the fastest any of these horses have run, and when you make such a dramatic leap forward it is only natural in today’s speed sheets era to want to give him plenty of time to the next race. With that said, I don’t know if you can apply normal speed figure handicapping to the Kentucky Derby, where it’s hard to go against all tradition and logic and expect a horse to win off an eight-week layoff and never having raced beyond 1 1/16 miles, regardless of what the speed figs suggest. If you have a horse who peaks like that in March going 1 1/16 miles, you still have to remember this is not like any other race or preparation. They could have given him just a maintenance race in his final prep, like John Ward gave Monarchos in the Wood Memorial after he had peaked with a monster effort in the Florida Derby. You can’t be afraid to get beat in a Derby prep as long as it helps get you to the big race the right way. I know times have changed when it comes to Derby preparation, and there’s a greater emphasis on speed figs and the bounce theory, and we’re getting more and more conservative, with fewer races and longer gaps between races. But, as a traditionalist, I want to see a horse do it before I can accept it. Destin looked like the one Pletcher horse who would have a good foundation going into the Derby and was taking the conventional route. They said they want a fresh horse and that they will have. But how far can you take fresh when going against 19 opponents at 1 1/4 miles? I believe this is a very talented horse with a bright future, and if this is the correct way to prepare him for the Derby we will know soon enough. After his 5-furlong sizzler in :58 3/5, he came back and worked the way Sise had wanted him to last week, getting his 5 panels in 1:00 3/5 in his final work for the Santa Anita Derby. We know how dangerous this horse is on the lead, but he should be tested earlier and longer this time. Although he’s never been looked in the eye, he is a fast, classy horse who can set fast fractions and keep going, so it could prove costly if anyone takes him on right from the start. But then again, perhaps the only way to beat him is to test him early and hope he’s not as courageous under pressure as he is dictating the pace. It would be ideal if he were able to sit back off another horse and still kick in late. American Pharoah did that in the Arkansas Derby and it came in handy at Churchill Downs when he had to win the Derby from off the pace. Based on pedigree, we don’t really know how far he wants to go, especially setting the fractions he has been setting. In his last three starts, his average half-mile split has been :45 4/5. We’ll see on Saturday if he can slow that down a bit when he stretches out another sixteenth of a mile. He doesn’t want to be running those kinds of fractions in the Kentucky Derby. Every time I see this colt I like him more, and don’t be fooled into thinking he’s just a plodder who comes from 15 lengths back. I loved his half-mile work this week, in which he went his first quarter in :25 2/5 and his second quarter in :23 2/5 and kept a strong pace past the wire with another eighth in :12 flat. His 5-furlong “gallop-out” in 1:00 4/5 would have been the fourth fastest of 37 works at that distance. He is a beautiful moving horse, with smooth, flowing strides, and he has a look of class about him. I would not mind at all having him at 34-1 in the final Future Wager. It will be interesting to see where he’s placed in the Arkansas Derby, in what will be his toughest test so far. One would hope he puts himself in better position than he did in his last two starts, even though he won one of them impressively. You can’t expect him to make up that much ground on a consistent basis, and he did show tactical speed in several of his races last year. He ran an excellent Thoro-Graph figure in the Southwest, which was a giant move forward off his previous start, so it was no big deal that he regressed slightly in the Rebel with a terrible trip. But with a clean trip in the Arkansas Derby I expect him to improve off his Southwest figure, which, speed-wise, would put him right in the thick of contention for the Kentucky Derby. He worked a half in :48 3/5, out in 1:00 3/5 and up in 1:14 4/5 in company with Far Right. The Arkansas Derby will be a major test for him, because he’s run winning races in his last two, but found a way to lose them both. We’ll see what he can do against a top-class field with a perfectly timed move. He also has to find a way for his sire’s family to trump his dam’s family when it comes to getting the mile and a quarter. We know he has the turn of foot you want to see in a Derby horse, but as mentioned earlier, it has to be timed right. It actually looked as if Irad Ortiz, who was riding him for the first time, timed it perfectly in the Rebel, but he may simply have run into a tiger that day, who re-broke when challenged and was drawing away at the finish. What I found really strange about the Rebel is that Whitmore’s Thoro-Graph figure was significantly faster than Cupid’s, which is pretty remarkable; not so much that it was faster, but how much faster. He is on an excellent pattern, and if he can pair up or improve slightly on his Rebel figure, it should set him up well for the Kentucky Derby, which makes his 33-1 odds in the final Future Wager very appealing. But with three weeks to the big race, you don’t want too big a leap forward. If all the pieces come together and we have a cavalry charge in the Arkansas Derby, he would have as much of a chance as anyone, especially with Ortiz knowing him much better this time. The Arkansas Derby is going to separate the contenders from the pretenders, but judging from the Rebel, there may not be a lot to separate, as they all look to have talent and a powerful closing punch. I find him a very intriguing horse who is heading toward the Kentucky Derby the right way. I believe it was a smart move keeping Lanerie, despite his two horrendous rides. He has owned up to his mistakes, he has won two stakes on the horse with a wide run, and over the past 3 years he has a 20% win ratio at Churchill Downs, and has earnings of over $10 million at that track alone with 14 stakes wins. Mo Tom has the same 6-week question mark as Gun Runner and has yet to hit a 90 Beyer speed figure. But that no doubt can be attributed to getting stopped multiple times in his last two starts, and swerving badly in the Kentucky Jockey Club Stakes last year. Like all stone closers, he prefers a fast pace, but has shown the ability to close a great deal of ground regardless of the pace. One thing we do know about him is that he can stop and go on a dime, but when he doesn’t have to stop we’ve seen what he’s capable of in the LeComte and Street Sense Stakes. You can take it to the bank that he will get an outside trip in the Derby, and hopefully we’ll get a chance to see what he really is capable of. With a top-class speed horse in Matt King Coal, and several other top-class improving horses in the Wood Memorial, he should have his work cut out for him. With only three career starts and having run slow times and figs, he needs to use the 1 1/8 miles to show marked improvement and move forward enough to suggest he can overcome his lack of experience and run a peak effort against 19 opponents on the first Saturday in May. As I mentioned last week, his unbeaten record and the determination he showed in the Gotham Stakes is what put him in the Top 12. But there are plenty of talented horses waiting to replace him if he doesn’t show significant improvement in the Wood. He doesn’t necessarily have to win, but he does need to be running hard at the end and finish strong, and most importantly convince people that he will move forward going 1 1/4 miles. Of all the big-name 3-year-olds with only three career starts, he at least has a stakes victory and has never run shorter than a mile, so there is some bottom to work with. I have no idea if Nyquist’s victory in the Florida Derby is a good sign for him in the Santa Anita Derby or not. Although Desormeaux was disappointed in his effort in the San Felipe, I’m still willing to forget that race, as he lost all chance when he broke poorly and dropped 10 lengths off the pace. It’s one thing running a :23 second quarter and :23 4/5 third quarter while in control of the race on the lead, but it’s another thing for a horse with his tactical speed to have to run that fast coming from last just to make up those 10 lengths and passing the entire field except the leader and eventual winner. Perhaps his last two starts show he is a better horse at shorter distances. It would not be a huge surprise by any means, but with his pedigree, cruising speed, and versatility, he deserves one more chance to prove he can carry his speed longer distances and come home fast. It looks as if Desormeaux was trying harness some of that speed in his latest work, in which he went 5 furlongs in 1:02 4/5, which is two and two-fifths seconds slower than he has been working. I have little doubt he’ll be right there at the eighth pole. It’s what he does in that final eighth that will determine whether or not he is a Derby horse. Looking over the Blue Grass Stakes field closely, I thought back to the first Derby Dozen when I ranked ZULU in the Top 12 even though he had only two sprint races. There was something special about him. He's been on and off since, due to several delays in his work patterns, having only four career starts leading up to the Derby, and others winning big races. I don't know why Pletcher is putting blinkers on him, but the more I look at him the more I'm thinking he not only can win the Blue Grass, he can win by daylight. These last minute revelations usually turn out to be misguided, but this one wouldn't surprise me so I thought I'd mention it.. I have to go on record as saying I don’t love anyone so far, which is why I’m finding it difficult placing these horses. There are just too many question marks, and I haven’t seen that quintessential Derby horse so far or that brilliant potential superstar, with the exception of Nyquist, who still has to show he can win the Derby off one two-turn race and one sprint. If they can get past the Derby, then he should be in a good position for the remaining two legs, which is what Team O’Neill is hoping to achieve with this schedule. We already have 11 horses who are scheduled to make their next start in the Kentucky Derby. We’ll see where some of them stand with points after this weekend’s stakes frenzy, featuring about 30 Derby hopefuls that could turn the Derby picture upside down, especially considering that only four of the 30 currently are on the Derby Dozen. Those in the Derby at this time with enough points are NYQUIST, GUN RUNNER, MOHAYMEN, MO TOM, TOM’S READY, DESTIN, LANI, OSCAR NOMINATED, MAJESTO, FELLOWSHIP, and AZAR. Of these, five are on the Derby Dozen. So just imagine the craziness this weekend when 26 new faces attempt to jump into the Top 12, some of which have been there already at some point and are back bubbling just under the surface. Those looking to get back among the elite are ZULU, OUTWORK, CHERRY WINE, BRODY’S CAUSE, FLEXIBILITY, and SMOKEY IMAGE. Two horses who could jump in with a bang are MATT KING COAL and MY MAN SAM. To demonstrate how important the Wood Memorial, Blue Grass Stakes, and Santa Anita Derby are, along with the following weekend’s Arkansas Derby, they are going to determine the Derby fates of big-name trainers Todd Pletcher, Bob Baffert, Chad Brown, and Dale Romans, all of whom will have at least two Derby hopes running, with Brown having three, and Pletcher four. Pletcher already has two in the Derby and has a very good chance for four and a pretty decent chance for five. There were several closing odds in last week’s final Future Wager that could prove to be steals. If ZULU wins the Blue Grass, which he surely can, imagine having him at 34-1. The same can be said about stablemate OUTWORK in the Wood Memorial. He closed at a generous 30-1. With the Rebel Stakes producing so many closely matched horses, considering their pedigrees and running styles, I would love having CREATOR at 58-1 and CHERRY WINE at 55-1. Those both can be monster overlays. And finally, there is the forgotten FLEXIBILTY, who was one of my most enticing future book horses at 100-1. If he returns to his best form in the Wood Memorial after a much-needed freshening, his 81-1 odds are going to look like the steal of the year. Creator and Cherry Wine both had excellent tune-ups, with Creator breezing 5 furlongs in 1:00 3/5 and Cherry Wine the same distance in 1:00 2/5. The latter will enter in the Wood Memorial, and trainer Dale Romans will no doubt watch the weather and how the fields shape up this weekend. Outwork was also sharp, breezing 5 furlongs in 1:00 2/5, while Zulu breezed a half in :49. Although he is among the Future Wager betting interests, closing at 84-1, AMERICAN PIONEER, with only two career starts, is hoping to earn a place in the Preakness with a good effort in the Arkansas Derby. How big of a roll is Santa Anita on when it comes to producing Kentucky Derby favorites and winners? Their three consecutive Kentucky Derby favorites – California Chrome, American Pharoah, and Nyquist – have a combined record of 22 starts and 17 wins going into the Derby. Although he wasn’t the favorite, if you add I’ll Have Another in 2012, it means that three California-based horses in four years have won seven of eight Triple Crown races in which they competed. As for last weekend’s stakes, we’ve pretty much discussed the Florida Derby, except to say that MAJESTO took a big step forward and looked good finishing second, although it may have been aided by a fast rail. I did like what I saw from the son of Tiznow from a physical standpoint and the way he moves. He just never did anything in his first five starts to indicate he was capable of running this good a race. FELLOWSHIP ran his usual third, except for finishing ahead of Mohaymen this time, and likely has nibbled his way into the Derby. You have to admire his consistency, and he does have a pretty decent turn of foot on the far turn. He was forced very wide by Nyquist and Mohaymen at the head of stretch and should be able to finish off his run better stretching out to 1 1/4 miles. Of course, Ken Ramsey had to get in the Derby picture, and with a son of Kitten’s Joy, winning the Spiral Stakes on Polytrack with his $75,000 claim OSCAR NOMINATED, who came out on top of a five-horse photo. Too bad Ramsey and trainer Mike Maker couldn’t have foreseen this and put up the $6,000 late nomination fee. Now, Ramsey will have to shell out $200,000 to run the horse, who has never run on dirt in seven career starts. If anyone wants to take a chance on sharing in any Triple Crown glory and purse money, they can go halfsies with Ramsey on the supplementary fee. Runner-up AZAR ran a very game race from the 12-post and battled every step of the way and fought hard to the end, trying to come back on the winner. He’s already won on dirt, so there are no questions in that regard. An interesting horse in the Blue Grass Stakes is DONEGAL MOON, who breezed 5 furlongs in 1:01 1/5 over the Belmont training track. I know he beat a weak field at Parx in his last, but he absolutely crushed them and visually looked terrific doing it, especially the way he was striding through the stretch and cantering home. He hadn’t done much before that other than almost kill himself with one of the worst stumbles coming out of the gate I ever saw. But 3-year-olds do get good fast this time of year, and it will be interesting to find out just how formful that Parx race was and if that was any indication of what we’re going to see in the Blue Grass. One of the more notable works this week was the brilliant seven-furlong drill in 1:25 1/5 on the Belmont training track by Wood Memorial hopeful MATT KING COAL, who likely will try to take them wire to wire. If he runs to that work, he could prove very difficult to catch. Also, there was the enigmatic BRODY’S CAUSE’S sharp 5-furlong breeze in :59 4/5. 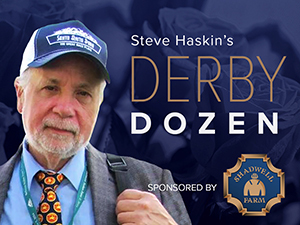 Always in the top three on the Derby Dozen, he is looking to prove the Tampa Bay Derby fiasco was a fluke and just a bad day, as he attempts to get back to his 2-year-old form in the Blue Grass Stakes. It wouldn’t surprise me at all if he’s back in the Top 12 after this week. That Tampa Bay Derby was just too bad to be true. Another interesting horse in the Blue Grass is the rapidly improving MY MAN SAM, who breezed a half in :50 and will look to use his powerful and sustained run to inhale his opponents in the stretch. One of those he will have to catch is the speedy maiden LAOBAN, runner-up in the Gotham Stakes, who drilled a sharp 6 furlongs in 1:11 1/5 at Los Alamitos for the charismatic Eric Guillot. Another work of interest was DENMAN’S CALL’S one-mile work in 1:43 1/5, as the San Vicente third-place finisher looks to stretch out in the Santa Anita Derby in an attempt to give Doug O’Neill another Kentucky Derby horse. Also working for the Santa Anita Derby was SMOKEY IMAGE, who went 6 furlongs in 1:13 2/5; I WILL SCORE, who blazed 5 panels in :58 flat, fastest of 50 works at the distance; and UNCLE LINO, who went an easy 5 furlongs in 1:02 2/5. You can’t say Japanese-trained LANI won’t be familiar with Churchill Downs, as the UAE Derby winner has already checked in, looking none the worse for wear. The son of Tapit no doubt will be closely scrutinized in his training and overall demeanor. He does add a bit of intrigue to the race. With the success of Nyquist this year, it would have been great if his arch rival SWIPE, could have made the Derby, especially considering in his four seconds to Nyquist, he got closer to the champ each time. Swipe just missed making the big dance and will have to settle for a debut in the Lexington Stakes. He has been sharp in all his works, with his latest being a bullet 6 furlongs in 1:13. In addition to Shagaf, Matt King Coal, Outwork, Flexibility, and possibly Cherry Wine, others pointing for the Wood Memorial are ADVENTIST, who worked 6 furlongs in 1:14 2/5; CADEYRN, who breezed a half in :48 3/5; TALE OF S’VALL, who breezed 5 furlongs in 1:00 flat, and CARDS OF STONE.